This PCB board includes all of the wiring for DC jacks, Input and Output and 3PDT Stomp switch, and a perfboard area of 18 by 21. ThePCB board fits in 1590 B sized box with room for a 9V battery. Here’s a picture of the PCB with Switch and jacks. Here’s a picture of the PCB fit into 1590 B box from the bottom. Leaves just enough room for a battery. exactly what type of jacks are you using in this template? Click on the PCBS link at the top. There is a longer description and part numbers for the jacks. The jacks are made by Nuertik the part numbers are for Mouser. You can get more detailed info at the Mouser site, just look up the part number. where are the pics? oh no! 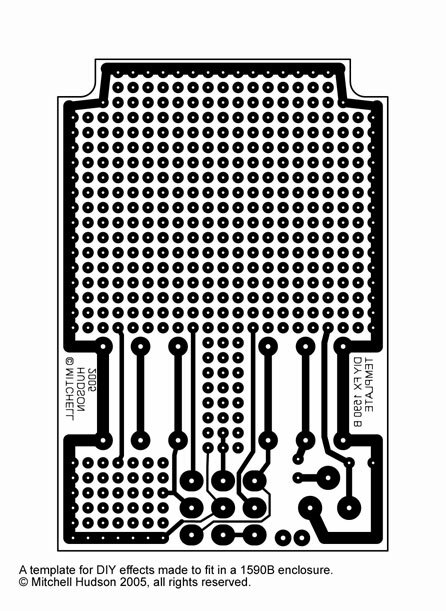 Hi, i know this is a old post but is it possible to get the original pcb data (eagle) to use this as a template to add some modifications? Thanks a lot.